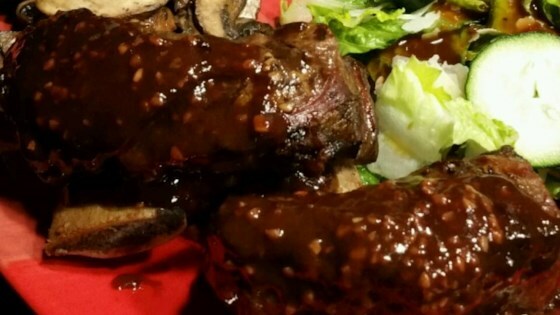 "The most unbelievable, easy to make beef ribs ever, man." THESE RIBS ARE VERY TENDER AND VERY TASTY TOO!! TWO THUMBS UP!! IF YOU LIKE THEM SPICY THEN JUST FIRE'EM UP! OTHERWISE THEY ARE PERFECT! THANK-YOU FOR SHARING YOUR RECIPE WITH US!!! This is NOT a good recipe for ribs. I much prefer the "Honey Ribs" recipe that's made in a slow cooker. These were bland and tough. Sorry! easy and fast and delicious! we used st louis style and didnt have red wine on hand, but the ribs are all gone! An excellent safe recipe. Good flavour and tender ribs. Made my pregnant wife very happy in a meat craving moment.